In our last post before the inevitably-washed-out-bank-holiday-weekend, we have a release from Studio Canal to bring you news of. 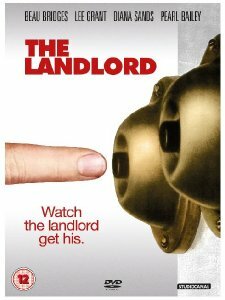 A directorial debut by Hal Ashby, The Landlord is out on DVD this 1st October. In the early seventies, with the impact of Martin Luther King Jr.'s death still raw, films exploring the impact of racial prejudice and mixed-race relationships were a rarity. This offering from 1970 was a mix of social satire, urban drama and high comedy. It stars Beau Bridges, Diana Sands, Louis Gossett Jr, Pearl Bailey, Marki Bey﻿ and Lee Grant. For his directorial debut, Oscar-winning film editor Hal Asby, tells the story of ayoung, white entrepreneur, Elgar Enders, who becomes the landlord of an inner-city tenement, with the intention of evicting the present occupants and constructing a luxury home for himself. What he doesn’t anticipate is the opposition he faces from the current low-income, streetwise residents. In the course of their dispute he unexpectedly starts to become fond of them and abandons the development, instead planning on a restoration.